Timeline jumping refers to the shifting of awareness from one series of possibilities to another. If you are in one timeline and you do not like how things are unfolding, then you can move to another timeline in which your dreams are more attainable. That’s because life makes use of all possibilities. Simply put, every version of events plays out. The options you didn’t choose in this timeline are being explored in others. The eternal, formless, limitless Being that is your soul knows no Earthly bounds. Your spiritual self is highly adept at the art of multilocation. That means you exist in multiple timelines simultaneously. For the linear, sequential brain, this concept can be overwhelming. Your soul, however, exists outside space and time. Your expanded consciousness can see all possibilities in all directions of time. Your eternal soul requires novelty, along with opportunities to learn and create. The restrictive nature of linear timelines presents a wonderful challenge. Truth is time is artificial. All things happen simultaneously. We simply choose in 3-D to experience them in a linear, sequential fashion. It’s like wandering blindfolded through a maze. As our 3-D experiment is winding down, our awareness is awakening to the existence of parallel, concurrent creations. The people who are wandering blindly through the maze of life are soon going to be able to see. That will help us to solve the puzzle faster and to move on to other dimensions of creation. Part of our awakening process is remembering how to access parallel timelines. You can see this happening in interpersonal connections as well as on the world stage. Have you ever had an upsetting disagreement with someone, only to have the conversation mysteriously shift in your favor mid conversation? Chances are you shifted timelines in order to reach an agreement. Do you find your version of past events differ, sometimes radically, from your friends or significant other? We often chalk up these discrepancies to having a faulty memory, but again, it may be that you are recalling events from a different timeline. We also shift timelines en masse, thanks to collective consciousness. Just look at forecasted world events that did not manifest. When we are passionate about changing something, for better or worse, we flip into a parallel, but different, timeline. The greater the desire and the need for change, the bigger the leap. For those of you who are old enough to get the reference, it’s like a scratched record. When the turntable needle hits the scratch, it jumps out of its groove. The larger the scratch, the more the needle will skip. The advantages to this spiritual practice are obvious. If you’re like most people, you have probably struggled to master the art of manifestation. Now, instead of creating your goal from scratch, you can align with a timeline in which your goal is fully manifested. This takes far less time, effort and energy. Gone is the need to petition higher vibrational beings for help. The power has been in our hands all along. Thanks to the thinning veil, we are beginning to reincorporate many of our forgotten abilities. 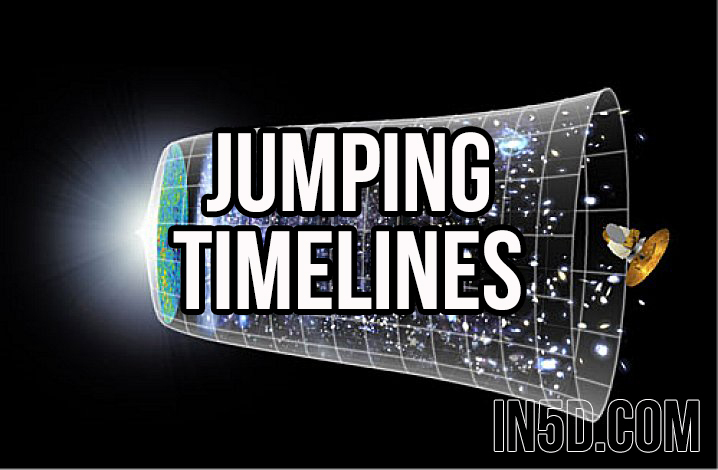 Did you know that you’ve been jumping timelines all along? The only difference is that we are steadily becoming more conscious of the truth. That means that you can do this. The only thing you need to learn is to jump timelines whenever you wish. The first step is to own your power. You must consciously reclaim this ability to jump timelines by recognizing that it is indeed possible. The next step is to recognize that everything is made of energy. That energy has a signature vibration. Your thoughts, feelings, words, actions and creations must all match your desire in frequency. Every part of you must be focused on your intent. As your vibration changes, you will automatically shift timelines. If you like what you experience in the new timeline, hold your vibration by continuing to feel the emotions which aligned you with your desires. To change timelines, change your thoughts, words, feelings and actions to align with your new goal. It will probably take more than a few attempts to get it right, but once you experience success, you will be motivated to try again. Eventually, this practice will become second-nature.